Have you always wanted a gecko as a pet? One of those beautiful, colorfully-patterned creatures like leopard geckos to care for? Well, although they are an excellent choice, you need to understand how to take good care of your leopard gecko. 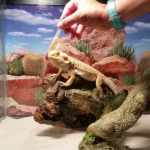 And even though a leopard gecko is among the easiest reptile you can take care of, these creatures come from a really unique natural habitat which these reptiles have adapted to and will require you to create an identical habitat in order to stay healthy. Because of this, it is up to you as an owner to buy the nest leopard gecko habitat there is and make sure that you fill it with the many requirements in order to mimic their natural habitat. The market offers a lot of enclosures and tank for geckos, so it is not that surprising if you are having such a hard time in choosing one. Well, we’re here to help! Here are the top 10 best leopard gecko tanks that will surely not disappoint you and your pet! 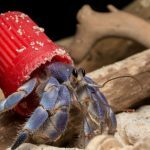 Exo Terra is known to be one of the most popular brands to offer amazing habitats for reptiles. Thus, we have their all-glass terrarium on our list. This top-notch terrarium makes and ideal leopard gecko habitat since it is specifically made with a leopard gecko in mind. This tank is adapted for the needs and desires of your leopard gecko. It is small tall, making it a wonderful choice for young geckos. And because this tank is all glass, it should prevent the loss of heat and humidity, thus providing constant temperature which is very important for the development and health of your gecko. Additionally, this tank allows fresh air to enter, thanks to its handy front window ventilation. It has a raised bottom frame which makes heating easy and safe as you add an under-tank heater. Its bottom is also waterproof so you do not have to worry. Moreover, you will totally love this tank since it is very easy to clean. Front windows and dual doors come in handy since they provide you access to the inside of the tanks. And the closable inlets ensure that the tank always looks great since there will not be any wires all over the tank. Now, if you wish to have a stylish terrarium, then this tank is the perfect one for you! This KollerCraft Tank does not have a classic shape but has a flat-backed which looks really elegant and makes your living room look vivid. 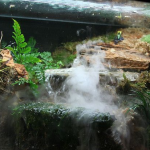 This tank has a 5-gallon capacity and measures 10x19x12 inches, thus it is ideal for leopards geckos and other kinds of small reptiles. It has a sturdy screen top that will make sure that your sneaky per will never have the chance to escape while also providing air circulation. Because of the wide flat-backed design, you can watch your leopard gecko for hours since there is no metal construction to hide the area of the tank. Moreover, this tank by KollerCraft offers plenty of space to add branches and plants in order to create the ideal leopard gecko habitat. You can totally place the light on top of the tank without even worrying about the safety of your reptilian buddy. As for its price this tank model is perfect for a low budget and for those who do not want to break the bank on a decent tank. Another perfect leopard gecko tank from Exo Terra, this model measures 18x18x24 inches which makes it suitable enough for leopard geckos and other reptiles to live in. The dimension is just right— not too small with a lot of space for your leopard gecko to wander around. Also, it allows you to decorate the tank with the necessary plants and branches for your leopard gecko have a natural feel. Additionally, this leopard gecko enclosure has two doors for accessing the inside of the tank without risking escape from your sneaky reptile buddy. 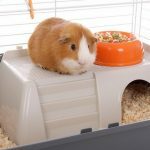 Moreover, this Exo Terra tank features a front window ventilation for fresh air to penetrate the inside of the cage and a water-resistant base. It also has a stainless steel mesh cover that ensures there is no escaping the tank. If you are a first-time leopard gecko owner, then you might want to start off with a gecko kit. But do not just choose any gecko kit since some might come in poor quality. Rather than those, choose this one from Zoo Med Laboratories. 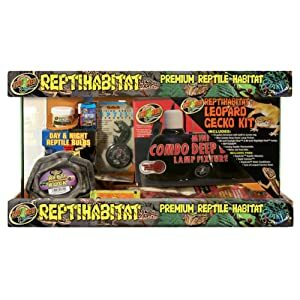 This particular kit makes caring for a leopard gecko a breeze since it comes with every features and thing that your reptilian friend needs for a happy living. This leopard gecko habitat might not be as durable as a glass one like Exo Terra, however, it is definitely worth the money and provides you with a good value. This gecko kit comes with a very reasonable price considering with what you can get with it. The unit is sturdy enough to secure a leopard gecko and provides it with happiness. It has an easy setup so you should not have any trouble with it even if it is your first time. Furthermore, the tank is very easy to clean which only adds up to its value and quality. Also, it allows enough fresh air to come in for your leopard gecko to breathe in. In case you are looking for a decent leopard gecko habitat which does not cost a fortune, then this cage from Exo Terra is the thing that you and your reptilian pet need. It looks nice, secure and sturdy. And when you add different decoration items, the tank will surely look amazing and will impress anyone who sees it. With a measurement of 8x8x12 inches, this Eco Terra tank is ideal for small reptiles like leopard geckos since it provides adequate space for your reptilian buddy. It has raised bottom frame, escape-proof door, waterproof bottom, and front window ventilation, all of which add value to every penny you spent. 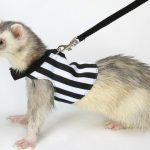 Another starter kit for every first time reptile owners out there who are not yet willing to get all parts one by one. This tanks is of high quality and comes with a lot of items needed to create the most comfortable habitat for your leopard gecko. Plus, it comes with an affordable price, so you will never have to regret your purchase and neither will your reptilian buddy. Made from quality material, this leopard gecko habitat is very sturdy and completely safe for your reptile pet. The tank has enough space which allows you to create shade areas and basking spots for humidity and temperature management. It also has enough space to add vines and plants so your pet will be very much comfortable. The Zilla Tropical Reptile Starter Kit is delivered to you with reinforced packaging, so you do not have to worry about it being damaged when delivered at your front door. Another great leopard gecko habitat from Zoo Med, the Open Air Screen Cage is a tall, anodized aluminum tank which has a huge amount of airflow because of its open designs. The anodized construction makes this tank really durable without being heavyweight. The tank comes with all the necessary hardware needed in order to set up the cage and all you need is a screwdriver in order to assemble the tank. Moreover, this tank can be decorated to your liking. This leopard gecko cage has two front doors— one on top for main accessing and one at the bottom in order to change substrates. It has a bottom tray which is designed for an easy access, changing and cleaning of the substrate. Like most premade tanks, this is suitable for small reptiles like leopard geckos. Another tank from Exo Terra, this high glass terrarium is another perfect leopard gecko tank which is a bit more polished than other premade reptile habitat solutions in the market today. It has a dimension of 24x18x36 inches which makes it enough for your leopard gecko to wander around. This all-glass terrarium from Exo Terra is specifically designed with a waterproof bottom, dual opening doors that do not allow any risk of escaping, and a screen top that allows penetration of UVB light for your leopard gecko’s health. This tank also features tube and wire inlets that allow easy installation of monitors, sensors and other cool features that you might want to add. The Zilla Screen Reptile Habitat is perfect in making your reptile buddy feel at home. This durable screen cage allows open-air circulation in order to replicate the natural environment of your leopard gecko. It is made of a tough black mesh which will not scratch or rip and its sturdy anodized aluminum frame is built to last. It also has a PVC plastic bottom which allows for an easy cleaning and a cord port that offers convenient wiring of other power accessories. The Exo Terra Screen Terrarium makes a perfect habitat for amphibians and reptiles like leopard geckos. It allows air flow which provides optimal ventilation while minimizing fungus growth and odor in your leopard gecko’s habitat. 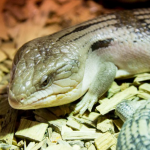 The screen design of this cage provides a broader temperature gradient that helps reptile in regulating their body temperature more effectively and also prevents overheating inside the cage. It also has an aluminum screen mesh which allows ultraviolet rays from the sun to penetrate the inside of the cage. 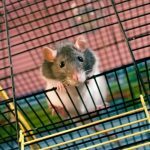 Its substrate tray also allows you to place a small layer of substrate items in order to increase humidity levels and absorb spray power and can be easily removed from the cage with the swiveling bottom door. Lastly, it has nickel plated latches which are sturdy enough and adds stability to the cage and will keep your reptilian buddy secure and safe. 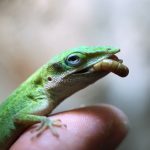 Choosing the perfect habitat for you gecko sometimes is a daunting task and could lead to a little bit of hassle and confusion. But that’s what this list is all about to put together the top 10 best leopard gecko habitat that is available out there. We have carefully choosen and reviewed the items for you, and it’s only a matter of your preference now on what to choose between them. Hope you loved our content and stay tuned for more amazing information.